As anyone who has ever used software knows, including NaturallySpeaking, its value is most often determined by the design of the user interface. If it’s hard to find menus, options, and features, most people give up before they ever find out if the product actually works. If you want simple, think Google Search Box. It doesn’t get any easier than that! Happily, the folks who develop the Dragon software have given a lot of careful attention to its user interface over the years. With version 12, they’ve hit it out of the park. They have a DragonBar and a Dragon Sidebar. Both are set by default to open when you launch NaturallySpeaking. You can customize them to suit your needs. 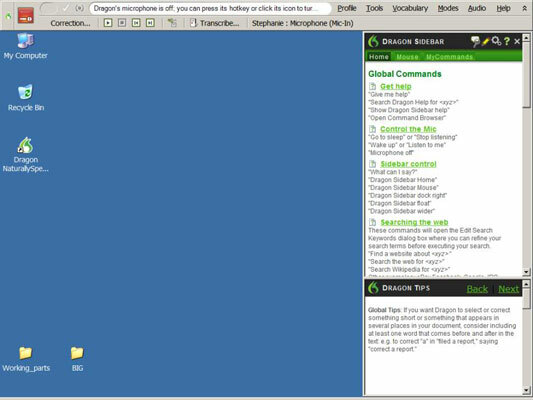 When you first launch NaturallySpeaking, you see the NaturallySpeaking DragonBar and the Dragon Sidebar. What can you do with the NaturallySpeaking DragonBar? You can use the menu bar to access various tools for customizing and improving the performance of your NaturallySpeaking assistant. What is the Dragon Sidebar? It’s a nice, controlled environment where you can get to know all the major commands used with NaturallySpeaking. You don’t have to wonder about commands. All you have to do is say, “What can I say?” The Sidebar pops up if it’s closed. The Dragon Sidebar window is context sensitive so it displays commands about the application you are working on at the time. For instance, if you’re in Microsoft Word, the Sidebar shows you the commands you need to use for Word. This makes learning application-specific commands much easier. It has Global Commands and a tab for Mouse Commands, plus one (MyCommands) that allows you to create your own Custom Commands. Customize your commands to make dictating even easier.